I just have to share the recipe for this one. I didn’t build it from any recipe that was in any book. It is simply trial and error, and I finally hit on a masterpiece that my children absolutely adore. I bake – a lot. I bake blind – a lot. I throw things in, measure how much they are and judge from the mixture, and how it looks, to tell me if it is enough or not. 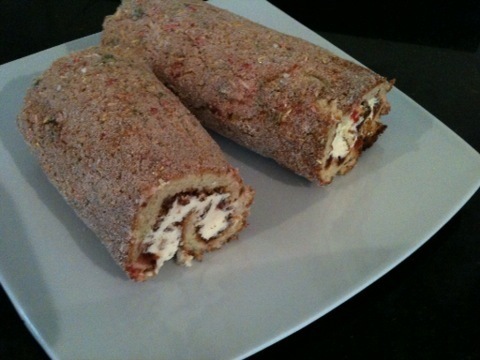 This recipe for the roulade is one that is very popular with my kids and there is NO fat in it at all. Are you listening – None at all. Sugar, eggs and flour, yes, but NO fat, butter, marg, or oil. The cake does still come out lovely and moist. My boys love the fact that I also use sugar strands to add a little decoration to the mix. Put caster sugar and eggs into a mixing bowl, or mixer and whisk until it begins to thicken. 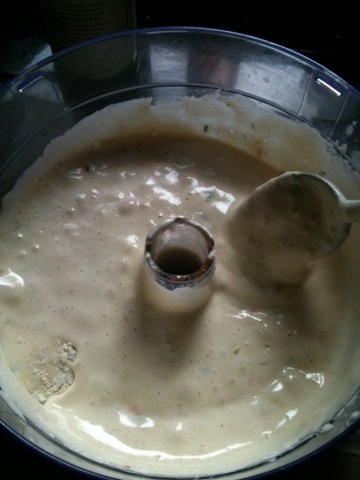 When the mixture turns almost totally white and lt leaves a trail, similar to yoghurt, it is ready. Simply add in the vanilla flavouring, and fold in the flour and sugar strands. 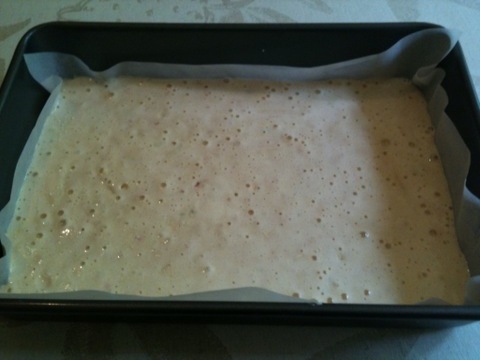 Use a baking tray about 8″ x 10″ and line with baking paper. Tip mixture into the tin. Bake at 200 C/400F/Gas 6 for approximately10 – 15 minutes. While baking, the sugar strands should sink to the bottom of the mixture. 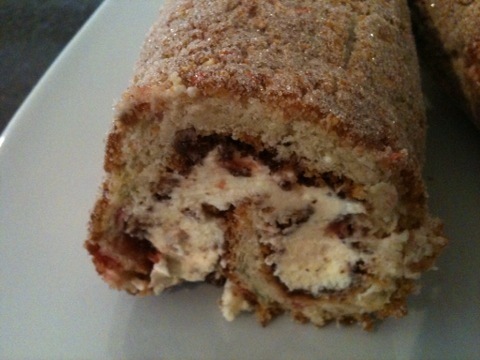 When the roulade is lightly golden brown and feels cakey to the touch, remove it from the oven. Place a piece of baking paper onto a table, sprinkle caster sugar all over the paper and tip your cooked mix out onto the paper. Press lightly onto the caster sugar and peel off the backing baking paper. Turn over the piece of roulade and repeat for the other side (which should be coloured with the sugar strands, and coated in the caster sugar). 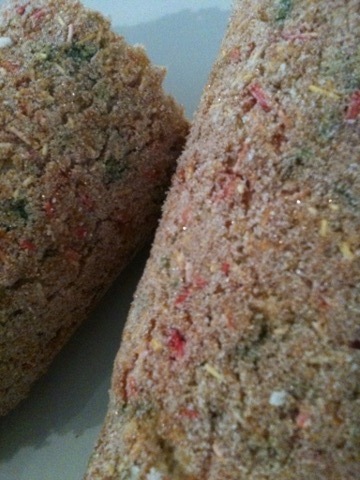 Leave the roulade on the baking paper. 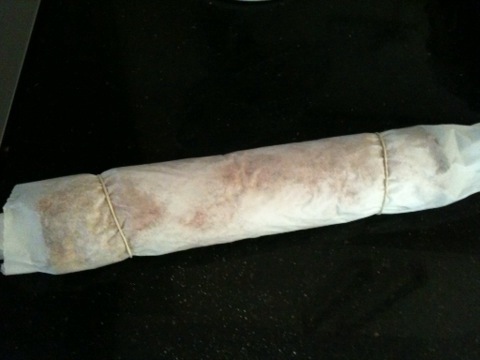 Roll it up while hot, and close both ends to stop it unrolling. I use elastic bands on either end. Leave it to cool until it is completely cool. If you unroll while it is still warm, it will fall apart. When it is completely cool, unroll it, spread on whipped cream and jam, and roll it back up again. I had to cut mine into two pieces, as one piece was too big for the one plate. Then, simply slice and eat. This roll must be kept in the fridge after making as it is fresh cream, and there is no fat in the recipe. I used a lot of cream for my recipe, about 6 oz double cream whipped would give a more perfect looking roll. I used more than that, and added jam so not so much room to have a perfect swirl. It all depends on how perfect you like your roll to look. If you want to remove fat totally, or have dairy free, you could use cream alternatives, or make different fillings, eg lemon curd, butter icing using dairy free spreads etc etc. Thank you. Go on, make yours, and show us all as well. Yep, fresh strawberry jam would be fab. Not sure it would be much use for a diet lol, as it still has sugar, but it is different.